Lowest price I have ever seen this cider for. I love the stuff so am very happy. Respect the cider as its very drinkable but 7.3% - so 73 Units of alcohol! That's about the same as 1.5l of Vodka. Seen in in many stores. Well worth checking your local one. Probably clearing the £15 stock they had last week. You sure this is tesco or was it Morrison’s ? I never added the word Tesco. Just for 7.3% in the title (those were the days) - voted HOT! Great deal, bought 2 boxes when it was £15. 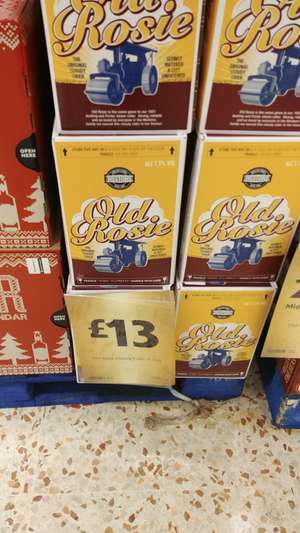 If it gets any cheaper than £13 I'm gonna go down and clear the shelves. Cheadle heath store. Still got these and the 4.5 litre famous grouse and also still a few of the large jagermeister. How long does it keep? Does it have a best before date and how long have you got once opened? Thx for posting OP! How long does it keep? Does it have a best before date and how long have …How long does it keep? Does it have a best before date and how long have you got once opened? Thx for posting OP! Lots of packs in my local this morning (when I went in for the £10 Baileys)! Best before date June 18 and no guidance to drink it before BB date so I'm assuming it won't go off quicker once opened? 53 pints now sitting in a cool cupboard. I'm guessing I might forget a pack or two and have a very boozy June! Thx again OP! I Picked up another one last night. It keeps for a recommended 6 weeks once opened, but I decant it into 1 litre screwtop bottles when the bag is half empty and it keeps much longer. Just picked up another box, thanks OP! I bought 2 more myself last night. It keeps for a recommended 6 weeks once opened, but I decant it into 1 …It keeps for a recommended 6 weeks once opened, but I decant it into 1 litre screwtop bottles when the bag is half empty and it keeps much longer. Wow! I'll need to create more space in my understairs cupboard then. Or I could just stack 'em up in the lounge as a temporary coffee table! Just picked up some more. They had half a pallet left in the Wincanton store, £10 each.